Bellong Mahathera was born on February 12, 1889 in Phnom Penh, Cambodia to a wealthy family. He was well educated and became a lawyer, judge and district governor before he began studying Buddhism and became a monk in his 30s. Bhante practised in the Forest Tradition in Thailand before travelling through Burma to India, where he spent much of his life. He studied natural healing and became well known for his healing abilities, in recognition of which he was given the land on which to found The Asoka Mission in New Delhi by Jawarharalal Nehru, first Prime Minister of Independent India. He returned to Cambodia to visit in 1952 and established a connection to Norodom Sihanouk, then still king. In 1955 he accompanied Sihanouk to the Bandung Conference in Indonesia. He first visited the U.S. in late 1955 and early 1956 when he was invited by the US Information Agency to attend a conference on education. In California, the yoga teacher Indra Devi introduced him to wine critic Robert Lawrence Balzer, who was already interested in Asian religions. With Dharmawara´s invitation, Balzer traveled to Cambodia and sojourned for two weeks in the temple where Dharmawara was staying, later writing about it in the book Beyond Conflict. He was fluent in many languages and travelled to teach meditation and healing to groups in many countries. Starting in 1973, he taught meditation, particularly on colour, every year to the students at John G. Bennett's Academy for Continuous Education in Sherborne, Gloucestershire. An extended meditation course he taught at the Asoka Mission from October 1974 to March 1975 is described in the book Leaving Lucifer. Later, Bhante moved permanently to the United States and worked to help settle the thousands of refugees who fled there from the war in Cambodia. 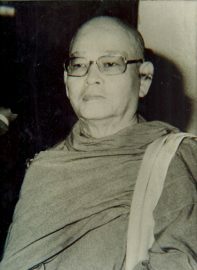 He founded the first Cambodian Buddhist temple in America in the area of Washington, D.C. and later Wat Dharawararama in Stockton, California. In 1989, following a shooting in which five schoolchildren were killed at a Stockton school, there was national press coverage when he went to the school to perform a ritual cleansing of the site. He died on June 26, 1999, aged 110 and his ashes have been interred in a memorial at Asoka Mission in Delhi where a celebration of his life is held every year on his birthday, February 12. ^ a b Stewart, Barbara (July 18, 1999). "Bellong Mahathera Is Dead; Cambodian Monk Was 110". The New York Times. Retrieved May 27, 2014. ^ Ministry of Foreign Affairs (1955) Asia-Africa Speaks from Bandung. Djakarta: The Ministry of Foreign Affairs, Republic of Indonesia. ^ Balzer, Robert Lawrence (1963) Beyond Conflict. Indianapolis: Bobbs-Merrill. ^ Roth, Allen (1998) Sherborne: An Experiment in Transformation. Santa Fe, NM: Bennett Books. ^ Romig, Elizabeth (2016) Leaving Lucifer: Part 1, The Beginning. Bloomington, IN: Balboa Press. ^ Times, Jane Gross and Special To the New York. "Stockton Journal; Where 5 Died, a Monk Gives Solace". Retrieved 2018-04-09. ^ "Bhante Dharmawara" (PDF) (Press release). Forest Sangha Newsletter. October 1999. Archived from the original (PDF) on 2007-09-27. Retrieved 2008-09-13. This page was last edited on 27 March 2019, at 15:23 (UTC).